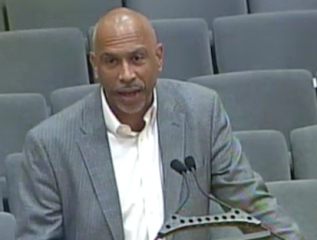 Pedro Noguera presents his recommendations to LA Unified board members and superintendent. Internationally renowned education expert Pedro Noguera warned members of the LA Unified school board and superintendent that unless more serious measures are taken, the nation’s second-largest school district is destined to lose more students. The challenges LA Unified is facing, he said, include declining enrollment because of the growth of charters and demographic shifts, chronically under-performing schools, structural budget deficits and the need to increase public support for schools. Noguera has written 11 books and more than 200 articles about education and focuses his research on how economic conditions impact schools. He served as a school board member at Berkeley Unified and is now a Distinguished Professor of Education in the Graduate School of Education and Information Sciences at UCLA. Committee chairman George McKenna invited the professor to make a presentation to offer advice and give examples of what other schools do. Nearly 16 percent of LA Unified’s students are enrolled in 211 charter schools, and that number would grow significantly under a plan to increase charter enrollment in the district, which the school board unanimously opposed in January. He pointed out his granddaughter goes to a traditional LA Unified school where the parents are only allowed to drop children off between 7:45 and 8:15 a.m., while the charter school around the corner allows drop-offs as early as 7 a.m.
“For a busy working parent, like her mom is, and in a city like this where transportation is a big issue, that is not a small factor,” Noguera said. That alone could be a reason for a family to choose a charter school over a traditional school. That includes the charter school and traditional school situation, he said. “Trust comes from collaboration,” he said. 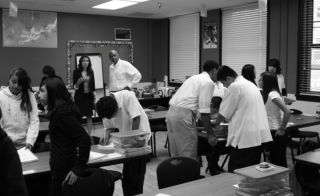 Noguera on a visit to Hollenbeck Middle School. Superintendent Michelle King asked how to replicate what is successful at schools, and he described a program in San Diego where leaders visit schools once a quarter and offer support to principals and teachers about best practices. whose teacher had complete control of her class and allowed students to help each other. Meanwhile, a class across the hallway had students who were unable to focus and were being disruptive. • Support and recognize high-quality teaching. • Provide incentives for teachers and administrators with a track record of effectiveness to work in “high need” schools and communities. • Prevent educational issues from becoming overly publicized. Monica Ratliff asked about the bonuses and incentives given some teachers to work in more challenging schools. Noguera said the incentives don’t even have to be monetary but could include more planning periods or other bonuses. “We should look into this,” Ratliff said. Noguera pointed out that some answers are within the district already but aren’t being shared. He said some schools might be very good at converting English-language students into the general school population, but the district doesn’t have a way of tracking which schools are better at it. He and other university education experts are visiting schools throughout the LA Unified district. “I hope this will be an ongoing collaboration with the district,” Noguera said.